Custom-blended ingredients provide economies, shortcuts for product developers. Choosing the right proportion of wet and/or dry ingredients, nutritional supplements, spices and seasonings, blending them carefully for optimal flavor, functionality and consistency then packaging them in the ideal materials for barrier protection and food safety are the challenges food companies and retailers face when creating new food products. It's a combination of science -- the bailiwick of food technologists -- and art -- a dash of creativity from the research chef, backed up by the expertise of savvy packaging engineers. Fortunately, the industry can count on the supplier community to simplify many of the complexities it encounters, saving time, investment and extensive research. Many ingredient suppliers specialize in custom mixes of ingredients. They help product developer shorten time to market, reduce some R&D and material testing costs and eliminate the need to audit multiple vendors. Food companies also can enlist contract manufacturers, or co-packers. From boutique enterprises specializing in one product category to major operations with multiple capabilities, contract manufacturers bring certain advantages. The cost of taking a concept to fruition can be enormous, and a startup food company may not have the physical capital — blending, processing, packaging and labeling lines, plus receiving, storage and shipping facilities — to turn a stellar idea into a finished product. PGP International, Woodland, Calif., is a functional and nutritional ingredients supplier specializing in dry-blending and packaging nutritional and sports performance beverage mixes. It also operates a contract manufacturing plant in Springfield, Mo. Doug Bishop, contract manufacturing sales manager, says clients usually approach PGP seeking the "proper facilities to do the blending and ultimate packaging of the proteins, vitamins, and whatever else their formulas require. We supply the necessary equipment and know-how in our plant to manufacture and package what they need with considerable reductions in cost, complication and uncertainty." Food safety is another variable. Some foods, such as meat and poultry, low-acid canned goods, or acidified products, require USDA compliance or certification. A co-packer can help secure those certifications, along with any mandatory HACCP fulfillment, kosher or halal documentation and ISO 9000 compliance. "When contract manufacturers follow those guidelines, it automatically raises the bar for the level of safety assurance we deliver [to customers]," Bishop says. Besides spelling out product specs and processing protocols, make a list that specifies everything from package type and retail price to estimated unit sales, advises Bishop. Let the contract manufacturer know how much you expect the business to grow to ensure accommodation of future volumes. How a food company chooses to secure ingredients when working with a co-packer may vary. A formulation might depend upon proprietary flavor enhancers or functional stabilizer blends a client already has specified and sourced. Or, the contract manufacturer can order the ingredients for direct shipment to its facility. 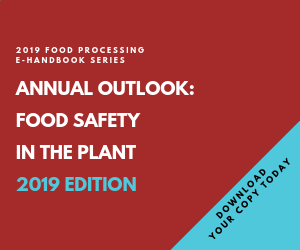 "Always specify proper storage, analytical specs, size requirements, necessary prep work (dicing, peeling, blanching) and acceptable substitutions, keeping in mind that substitutions may require changes to label declarations and ingredient or nutrition statements," says Bishop. Whether using an ingredient supplier or a co-packer, there are advantages to tapping into their bench of ingredients; these include efficiency, reliability and price. While you may need only small quantities or a given ingredient for a blend, your supplier probably already has them in inventory and procured them with a quantity discount. R&D services may include everything from formulation and scale-up to safety determination, shelf-life testing and nutritional labeling. "This is crucial for food companies just getting started," says Bishop. "If all you've got is a benchtop recipe -- often a far sight from a scalable formulation -- your product will likely require functional ingredients, such as supplements or flavors that aren't common to the kitchen cabinet. Contract manufacturers can identify those needs, as well as appropriate pH levels, necessary kill steps, proper filling and packing temperatures and the documentation required." Experienced contract manufacturers also anticipate problems that arise when processes that were effective in the lab or test kitchen, such as thermal treatments or agitation, prove inadequate at the production level. They know how to respond when shear forces from pumping or filling break down a product's texture. Bishop also notes a contract manufacturer can target a desired price point for a client by adjusting ingredients. "And we have the ability to provide all the necessary nutrition information and ingredient listings for the nutrition panel on the label. At the client's request, we'll send that right to where they're having their artwork designed," he adds. "Before we even start, the customer has a review of our QA certifications," Bishop says. Ingredients don't make it past receiving unless they test negative for all the usual suspects: microbial, allergens, heavy metals and toxins. "We also test during production, once we've blended all the ingredients together, and test after production. It takes five days to complete all the tests and obtain clearance for shipment." With FDA approval, Coke and Pepsi already rolled out drinks; Dr Pepper promises one. What's the Cost of Ingredient Cost Control? As food ingredient trends go, so go trends in equipment.